Wasn’t I just telling you about my planned mini-break from aromatase inhibitors? It sure seems that way to me. By the way, thank you to the wonderful response to my two previous posts on the dark side of aromatase inhibitors. You can check them out here and here if you missed them and care to. Seems there are many out there suffering in silence. Hate that. Breaks, at least breaks from the unpleasant stuff, always go by far too quickly. My temporary break from AIs is already over. My PCP wanted me to take one month off. I opted for two. I did enjoy my time off and yes, I did start to feel better. So why am I going back on? Well, first and foremost, I don’t want to have regrets down the road for not trying my damnedest to make this adjuvant hormonal therapy regimen work. Even while on my short hiatus, I’ve had thoughts of rogue cancer cells doing what cancer cells do best, growing and multiplying in silence. Cancer is sneaky and silent. Secondly, I want to prove to oncologist #5 that she was wrong about me. As you might remember, she told me (yes told, not suggested to me) that I would never go back on if I ever decided to go off AIs. Okay, so I’ve got a quiet rebellious side. Anyway, I’m back in the AI saddle and hoping Aromasin® is a bit gentler. My five years will be up in roughly 820 days. Have you ever switched (or stopped taking) a medication due to side effects? Have you & your doctor ever discussed taking a break from a medication? Are you taking Aromasin® or another one of the AIs? Diane, I guess it does at that. Thanks for stopping by. Yes I have I have stopped them all. Arimidex, all… The side effects were killing me the pain unbearable. I stopped Tamoxifen after i developed severe Endometrial hyperplasia never had it before…until tamoxifen. Alli, I’m glad you have no regrets about your decisions. Sometimes going off these drugs is the best option. Thanks for sharing. Thanks for sharing experience. I just got switched from arimdex to aromatasine. We will see how it goes! Hopefully not as many side effects as with arimedex. I had such a bad reaction to Arimedex that they told me to take a break and try starting it again after Christmas. I couldn’t bring myself to start it again (nonstop hot flashes, diarrhea, heart palpitations, and about a week into it aching so bad I couldn’t get out of bed). So, my oncologist put me on femara instead. Still have side effects, but this is at least tolerable. And yes, I am on several other meds to handle side effects to this. Because I had a recurrence, I am also now on monthly injections of faslodex, which is not an AI, but plugs estrogen receptors in case any estrogen got past the AI. The oncologist said no side effects except pain at the injection sites. The nurse handed me 2 pages of them, most of them the same as femara, so when your side effects get worse, who knows which drug is to blame? Injection sites swell and hurt for about a week and I am too dizzy to drive myself home afterwards. Because I had a recurrence, my oncologist says it will be longer than 5 years, actually probably for life. I would love to have a vacation from these drugs. Elizabeth, Yes, who knows? Sometimes we don’t even know which drug to blame. I realize I’m lucky that I at least have a possible end date in sight. I know those of you living with mets will be in treatment ongoing. At the same time, I also know you guys understand where I’m coming from. Thanks for adding to this discussion. Catherine, Thanks for your words of encouragement. You’re always so supportive. Hope the Aromasin treats you much better than the Arimidex did. I also stopped Arimidex after 16 month. The crippling pain was just more than I could handle. And Aromasin was not an option because my body doesn’t deal well with steroids. My doctor said I should take something so I starting taking Tamoxifen a few days ago. Sonja, I hope things go better too; it does seem like Arimidex is hard for many to tolerate. Good luck with the Tamoxifen. Thanks for reading and commenting. Nancy, after 4.8 years of tamoxifen and 3 D&C’s, I developed complex endometrial hyperplasia with atypia–and the recommended treatment is a hysterectomy. So, I got a second primary from tamoxifen, and lost another reproductive organ. Turns out if you have polyps on tamoxifen and get more, your risk is 18 fold higher for developing atypia, but no one told me that, and I really don’t know if I would have thought a 12% risk of high grade atypia was worth the lowered risk of breast cancer. I just wish I knew so I could have made an informed decision. My medical oncologist never, ever discussed it with me, despite the fact I made an appointment as the D&C’s kept coming. Not even in her note. Not her problem to monitor the drug she prescribed. So, I’m off adjuvant therapy, and into surgical menopause. I worked in radiation oncology and the men with prostate cancer who took lupron: there was so much concern about the severe metabolic side effects of chemical castration, that latest recommendation is to use it for the shortest period possible. I know prostate cancer is usually a well behaved cancer, compared to breast cancer, but the concerns about the side effects of lupron on men just never come up with adjuvant therapy for women. Kira, You make some very interesting and troubling points… I’m sorry you didn’t feel well-informed about the risks of Tamoxifen. That’s a shame. And yes, hard trade offs for sure. No, you can’t make this stuff up… thanks for sharing about your experience. Nancy, Thanks for a post that reminds us all to take an active role in managing all of the tradeoffs. (A break can be a beautiful thing!) Hoping Aromasin is a friend to you and enemy to that darn cancer. Beth, I know I’m lucky to be able to take a break. It was short, but I did enjoy it while it lasted. Thanks for commenting and for the good wishes too. Lisa, I’m so glad you are doing well on Aromasin and yes, I hope things go well for me too. Time will tell I guess. And there certainly is a love-hate relationship with these drugs isn’t there? Thank you for reading and taking time to comment. I will be seeing my MO tomorrow morning to tell her I stopped taking Arimidex. I am going to ask her about DIM or I3C. I hear that it is natural and also inhibits estrogen without the SEs. Don’t know how she will feel about it, but it’s worth a try. Cyndy, Hope your appointment goes well. I don’t know what DIM or I3C are. Good luck and thanks for commenting. Thanks!I think your blog will be of great help to me in the days to come. Vivian, Hi and welcome! I have started Aromasin and so far, so good. I haven’t been on it long though, so time will tell. Thanks for stumbling upon my blog. I hope you do find it helpful. Feel free to chime in whenever. My best to you and thanks again for finding me and letting me know that you did! Sharon, I’m sorry your doctor has not been helpful. Don’t keep quiet about your issues. You deserve to be heard and you deserve help in managing side effects of treatment too. Keep me posted. Good luck. I am glad I found your blog! I have been on AIs for over a year now and have similar side effects. My diagnosis of stage 3A BC was 4/12, had a mastectomy, 6 months of chemo and 5 weeks radiation. After I had been on femara for 3 months my oncologist let me take a 2 week break during a vacation. I couldn’t believe how good it felt to be off!! I then started aromasin hoping the side effects were less—not! I have had 2 reconstructive surgeries this past August and December and had to stop the aromasin for 2 weeks each time and felt so much better during those times. I really felt like I had gotten past the side effects after restarting in December but the have they returned over the last month and seem worse than before. I stopped taking it last week and have an appt with oncologist this week and will ask to start tomoxofin. I am determined to take medication to prevent recurrence just hope I can find one that is more tolerable. I hope there is research being done to improve AIs!! Thanks Nancy for this forum! Dottie, I’m glad you found my blog too. Welcome! I hope you have a good discussion about all this with your oncologist. It sounds to me as if trying Tamoxifen might be a good option to try. My oncologist and I also discussed this as another choice for me if and when… Presently, I’m still on Aromasin. Time will tell how this all goes. Good luck to you. Keep me posted and thanks for commenting. I cam acroos your blog (i am from the UK) because I was just trying to find if anyone else had problems with Anastrozole or was it just me! Started off fine with it then the side effects started to kick in big time. The aching joints night sweats not sleeping, not having a brain (although some may say I never had one in the first place! )Carpel Tunnel Syndrome, Trigger Finger where the fingers lock but the worst one was the emotions I know I have been a nightmare to live with and I keep apologising but men particularly don’t seem to get it. I am to taking a break I have been off it for a week and the emotions are even worse! If that happens when you come off it after taking it for 11 months heaven knows what will happen after five years. I am definitely not going back on it. So I feel a long discussion with my Oncologist is going to happen! Good luck to all keep going and don’t worry about complaining or moaning you are entitled. Kay, Welcome to my blog. Please be sure to have that long discussion with your oncologist. Going on these meds is a big deal, but going off of them is too. And remember, sometimes a different medication works better and is worth a try. Good luck and thanks for sharing. I also was on generic Femara for about a year and experienced the SAME side effects you mentioned, Kay! My onco switched me to Aromasin but my insurance would not cover it and it was WAY too expensive so he changed me over to Arimidex. I have been on it for about 6 months now and I agree with other posts about the severe joint pain and osteo issues. Been reading a dozen or so sites and researching all day about what to do. Onco said I can think about switching to Tamoxifen at next visit in July but since I am post menopausal and estrogen positive I think the best bet for me is to tough it out for another 2.5 years and not take a chance of uterine cancer or other problems. I am currently receiving physical therapy which is helping a bit. I also do not want any hot flashes/night sweats worse than I already have….its almost more unbearable than the joint pain! I am finishing a month off of meds and due to start aromasin soon. How is it going for you? Truthfully scared stiff- but given my situation not much choice . Planning to start with 1/2 dose then build up. Given the potential side effects planning to take in the morning. Any other words of wisdom? Ann, I don’t blame you for feeling nervous, but remember not everyone experiences side effects and even if you should, yours might be mild and “easily” managed. Try not to expect the worst. I’m actually doing a lot better with the Aromasin, so far anyway. I take mine in the morning. Good luck. Keep me posted. I really hate that most oncologists are male and haven’t had to experience bc. I am currently on break from Anastrozle and I was only on it for 7 months. I doubt I will be able to take it for the full 5 years and I won’t take anything else. This is the only drug that I will allow into my body. I can’t do a steroid as I already have to take Prednisone for Asthma flareups and I become a depressed and fat insomniac. Sue, Interesting point you make about male oncologists. I’ve actually had five oncologists and my previous one was female and was a horrible fit for me. 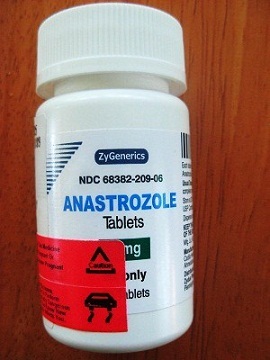 I tried her out because she was a woman, so… Sorry to hear you’re having trouble tolerating Anastrozole. I had trouble too. All I can tell you is that I’m doing better on Aromasin, so don’t rule it out. Good luck with things and thanks for sharing. i am so concerned about this arimidex it is horrible! I want to throw it out the window everyday! I had every side effect on chemo I now live with side effects from chemo. Some of which I got back on AI. I never went on line until after two years I noticed my hair not only thinning but not growing on top male pattern baldness which I found out on-line not from my oncologist which truly upset me. I called the nurse who treated me during chemo about this side effect no suggestions! When I told her I also read during the five years women started to loose their hair! She told me there is nothing proven, I told her all I have to do is look in the mirror! She said I was told about the thinning hair I said no I was not I have the sheet you gave me! I think they only want to down play all the se on this so you stay on it. I was a model patient before this I had the ACT protocol which I was told they don’t change. Me not knowing what she meant till I started chemo. Anyway my point is I had the worst case of mouth sores they ever saw and I will say my onco is a good man he recentley listened to me state and vent about arimidex and apologized about not telling me about the hair issue. He was going to take me off the chemo and change it back then I felt like I was failing chemo and saw the same effect on all the drugs so I stayed on the A the red devil. I went to a dermatologist for the hair if any of you want to know she took my blood to check my phea level to check for a hormonal imbalance which causes male pattern baldness my level is normal at this point so I have a base line so I do not need to go on this drug called spirals tone. I am however using men’s rogaine and it has started to work. None of which I would now if I was not proactive the opposite of what I was 3 years ago I have had 5 surgeries due to complications I am ok and now have beautiful breasts but I am alone lost my husband before this. I do like the idea of taking a break that sounds worth a try my onco said I could go off I said I would try to make the five years I feel like I am going crazy mood swings are aweful I told him everything. They are doing those studies you know about 10 years of this I will not do that if this cancer comes back after 5 years or before that is it for me physically mentally I would not could not go through any of that again and trust fate it is my time to go I am now 59 into 2nd year of this drug I want to at some point feel like myself again quality of life not quantity for me. Wendy, Good for you for being proactive. Hair thinning/loss is a common side effect of the AIs. I am experiencing it too and I hate it. There are a lot of possible side effects and I’m sorry you’re experiencing more than your fair share of them. QOL is very important and each person must decide what she is able to tolerate and then put up with. And as I say over and over, never just suffer in silence. Thank you for reading and sharing about your experience. don’t give up. had double mastectomy age 42, complete hysterectomy 6 mos later. on tamoxifen 11 years yes 11. at 67 ruptured implant due to c underneath it, had another double mast, arm and pectoral muscles removed. one lymph node positive. just today off 5 yrs of arimidex . five years of every side effect, today go on aronasin indefinitely. but am now 73, lived to raise 2 successful daughters and enjoy two grandsons. but many years of pain when on meds. also chemo and 36 rounds in 6 places, refuse to let this rule me. good luck and many prayers. Nina, Thank you for the encouragement. Glad to hear you’re doing okay despite all the hardships along the way. Thank you for sharing. 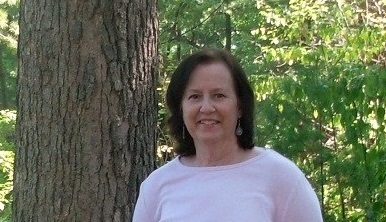 Hi Nancy – I was dx in 2011 – went thru the chemo reconstruction and then put on Femara. My 1st onco (I am on #3) failed to mention side effects to me and I was too overwhelmed at that point to look them up. I was told to continue exercising as normal. Shortly I began to feel a twinge in my left knee – figuring it was nothing I continued treadmilling and walking. Long story short – I ended up with a torn meniscus in my left knee and my hands were curling up with trigger finger. I had surgery on my knee and thumb. When I stopped the Femara – I immediately went back to normal and healthy. I have never had bone or joint issues (knock on wood.) Onco #2 told me I no longer needed an AI because I had had a full hysterectomy – a non malignant cyst was found on an ovary and Onco #1 advised for a full hysterectomy. So I was happily off the AI’s until Onco #2 retired and I chose my Onco #3. #3 is a younger hipper female Onco whom I very much appreciate after the stodgy old men that had been my Oncos. She quickly advised me that AI’s are not optional just because of a hysterectomy, WHICH by the way I learned (from her) that I likely did not need! I am already 5 years out but she is BEGGING me to take aromasin for another 5 years. I take a pill here and there but am having trouble taking it routinely because of what I have been through. How are you fairing on the Aromasin? Any info appreciated!! I was put on femara after my right masectomy, recon, n chemo in 2014. After one year dr switched me to arimidex after I complained of severe joint pain/trigger fingers n found out I had osteo arthritis. Also suffered with extreme n constant hot flashes since chemo put me into early menopause. After 6 months saw only slight improvements so dr suggested aromosin. I had hesitated earlier for this choice as it cost more per month on my ins plan. It has been almost 6 months now on aromisin and seeing cosiderably less joint pain and hot flashes are very rare!! Worth the extra$! Lindsay, I think I took a month off between. I stopped Arimidex and switched to Exemestane, too. I am doing better on it. Still hate it, but doing better. Good luck! I was diagnosed July of 2016, I have tried all AIs and have found that Exemestane (Aromasin) had had the least side effects. I’m 46 and while I was on Amirdex I felt like I was 100 years old. My bones ached, hot flashes, I could only take it at night because of side effects to include dizziness. I’m happy to say that Aromasin works for with very little side effects. 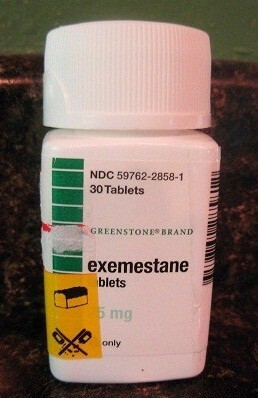 I have had the opposite effects: exemestane as worse than Amirdex. I guess it just depends on what your body can tolerate. Do what you can do, quality of life without these two, for me may just be the answer and hope breast cancer does not return. Hi Nancy , are you still on aromasin, and did you ever experience blood pressure problems ? Vee, Yes, I am still on Aromasin. I have always had very fluctuating blood pressure readings. Sometimes it’s up quite a bit, sometimes it’s just fine. I can’t say I’ve noticed any big difference on the meds. Are you having bp issues now? Thank you so much for the wonderful rant. I needed that. I have had cancer twice. The first time, after lots of surgery and chemo+ Herceptin, I was put on Arimidex and did just fine. I trained for and climbed Mt Kilimangaro while taking Arimidex. Ten years later (2017) I had a recurrence. This time they did chemo+Herceptin and rads and then put me on Aromasin. I absolutely could not tolerate the Herceptin this time when I had been fine with it before. I stopped taking it at 9mo instead of a year. (found a recent study out of the UK proving 6mo is as good as a year) I was having extreme cardiac side effects, heart pounding out of my ribcage from a few steps etc. Now that the Herceptin is clearing out and I’m feeling a bit better, I’m looking at the Aromasin and thinking it may not be my friend either. I’m still having muscle cramps and weakness and joint pains and get dizzy headed from minor exertions. My point is that I think our bodies change. What may have been tolerable once or for one person is not at another time in another combo or for another person. Herceptin was fine for me in 2008 but not in 2018. Arimidex was fine then but Aromasin isn’t now. Perhaps it is just that, somewhere along the way, the body reaches its lifetime limit on pharmaceuticals and starts to push back. I also think that these side effects are often massively under-reported because it is difficult for the average couch potato to sort out what is coming from the pills and what is the result of just generally getting older and having been through the trauma of cancer. The thing you and I seem to have in common is that we are not that old, not that out of shape, and we also refuse to “just do what we are told”. We know our bodies and we know when something is wrong. Robin, Thank you for sharing about your experiences. You make good points, for sure. We are all so unique in how we react to these drugs. I mean, these three drugs are supposed to work pretty much the same way for a lot women (and men). Hmm…maybe not. And I agree, the side effects are under-reported for a lot of reasons. Sorry you had the recurrence. You’ve been through a lot. My best to you. I am so happy to have read your piece. I, too, believe that each individual is different, and that our bodies change and can “max out”. I had extra radiation, extra chemo and tamoxifin for 5 years after bc at age 48 (stage 3). Then they gave me arimidex and I couldn’t even walk with my students. I am an active slender teacher. My cancer returned (a small spot to the skull), and they removed it easily and sent me back to teach. Now on Letrizole, I feel extreme anxiety, depression, brain fog, dizziness. Insane trying to just drive to work. I’m off it for a week so far, and just want to live normal again after 9 years. So hard to fight with oncologist, but I can’t live daily like this. It affects my active life at 56. Don’t want to go on with these pills!!!! Did you know that the main difference between arimidex and aromasin is that the latter is steroidal? Both have major issues with bone loss and can even cause cardiac problems. I’m not sure a few more statistical points on the recurrence rate are worth it if I spend my last decades in a wheelchair due to a spinal fracture or it give me a heart attack. I’m having a lot of hot flashes from Aromasin. The Onco and the Pharmacist told me they would stop. They didn’t. I was paying $73/month for generic Aromasin. Medicare does not cover this drug. My nurse friend warned me about Tamoxifen saying it was not good drug and had more side effects than any of the other drugs. I asked the Onco to switch me back to Anastrozole, which was the first drug she put me on after treatment. Sometimes, I wonder if I really should be taking a drug. Yes, I was Stage II, but my five-year recurrence estimation was 10%. It baffles me, but I have three years to do.